As mentioned before, Blackberries should not be thought of as smartphones. 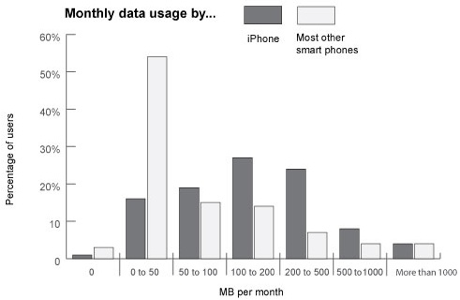 On average, iPhone users consume 273 MBs of data per month. That compares with 54 MBs for consumer users of Blackberrys and 150 MBs for consumers who use other brands of smart phones, the Validas study found. The disparity in data usage is particularly evident at low levels, where 80% of BlackBerry and 54% of “other” smartphone users consume less than 50 MB of data per month while only less than 20% of iPhone users maintain such low usage. As I argued in the past, Blackberries should be considered feature phones. Doing so helps to understand both their limitations and their potential. This categorization helps put into perspective the phenomenal growth RIM is able to maintain while not being at all competitive with other platforms by any measure of performance that defines the basis of competition in smartphones. Being a feature phone means the Blackberry just needs to be better than a dumb phone, something it’s more than able to demonstrate to a prospective buyer.